John, I love this one and would love to acquire the print but I guess I have to wait until the next time I am in Dawson working on the wastewater project or are they available in Whitehorse? I have a bed & breakfast type house and I rent out two suites and one is called the Fireweed Suite and the other is the Raven Suite and this would so suit the latter. 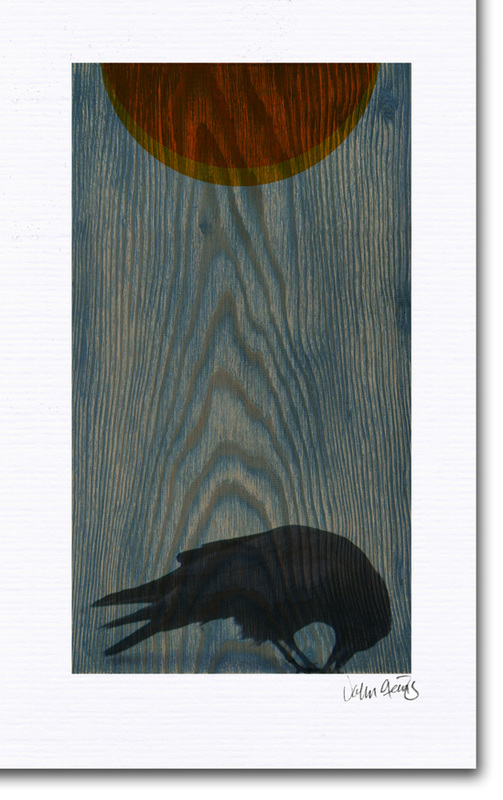 My favorite thing about it is how the wood grain shows through the raven image – very nice touch! I know it shows through the sun also but I think this must have been difficult to achieve through the colour black…. Hope spring has come to you early enough this year! Thanks very much Doris. People really seem to gravitate to this image and it sounds like a perfect fit for your B&B. I’ll send one down to the Yukon Artists at Work Gallery in the near future. Of course yo are always welcome to drop by my studio when you’re in Dawson next time.